Happpppy Friday! Anyone in the mood for a little Christmas cheer? 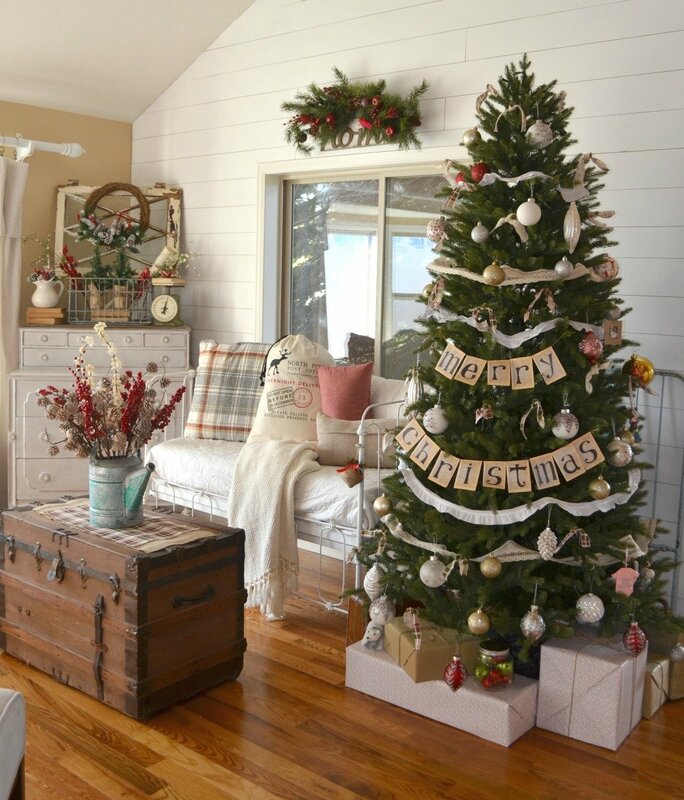 I hope so, because today I’m over the moon excited to be sharing my vintage farmhouse Christmas tree with you! 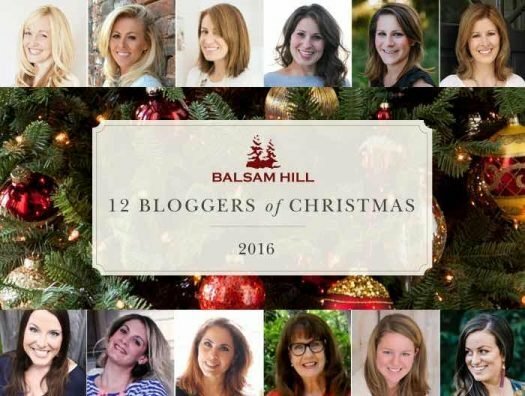 I’m also happy to say that I was selected to join in on the Balsam Hill 12 Bloggers of Christmas tour. Balsam Hill is the leader in artificial trees and all things Christmas, so it was an incredible honor to be included. I’ve had our tree up and finished now for several days, so I’ve been anxiously waiting to show you. Come on in and take a look! This is the 6.5 foot Balsam Hill Calistoga Fir Instant Evergreen Tree. I chose this one because it is their easiest tree to assemble. Really, the whole thing took probably 10 minutes. We couldn’t believe how simple it was. I remember helping my parents put up their artificial tree years ago and it was like a putting together a puzzle–it took hours to do. Not with this guy. It comes in three sections and all of the branches are already fluffed up and ready to go. Seriously, so easy. And look how realistic these branches are! It definitely exceeded my expectations. 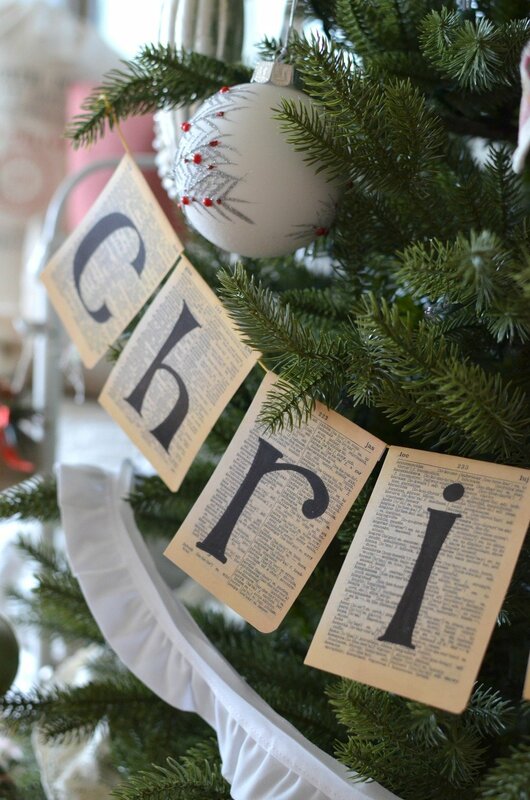 This vintage book page garland was actually hanging on our mantel last Christmas. This year I decided to cut it in half and use it on the tree. I’m pretty smitten with it here! 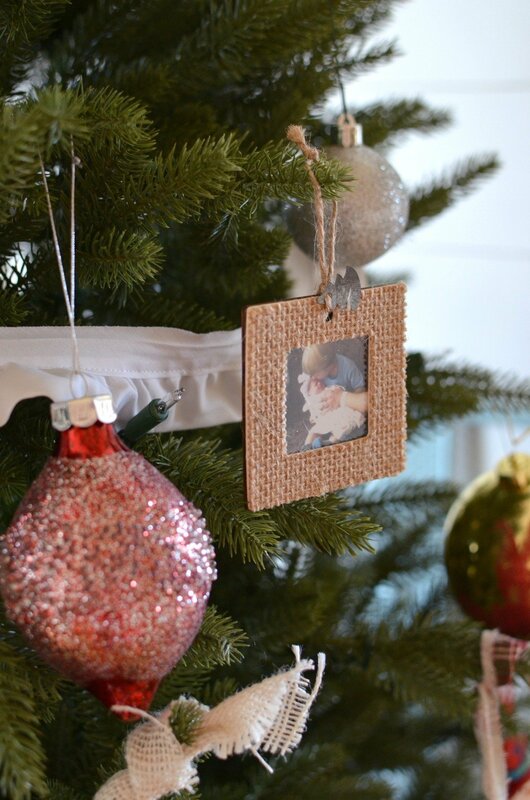 And how gorgeous are these ornaments? The larger ones here are from the Nordic Frost Ornament Set. They are hand painted and stunning. 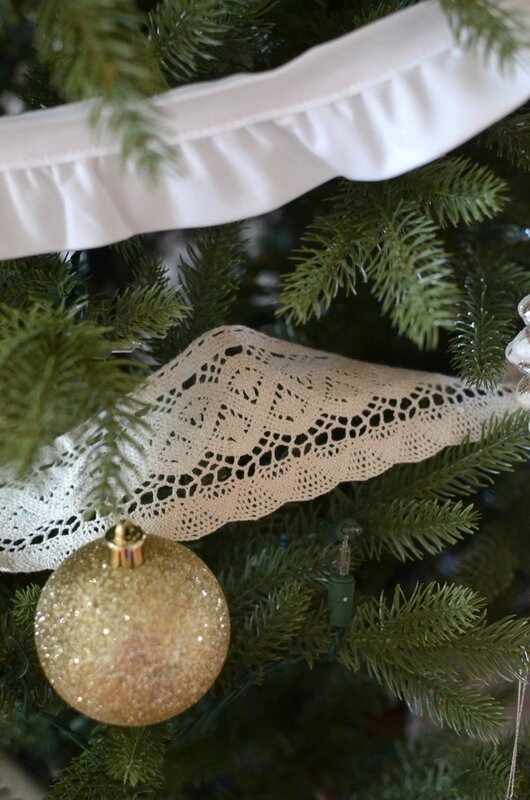 I saw this crocheted lace trim at Hobby Lobby and I thought it would be perfect for our tree. Kind of has a dainty, antique-y look, huh? I got 4 yards and cut it into strips to wrap around the front portion of the tree. 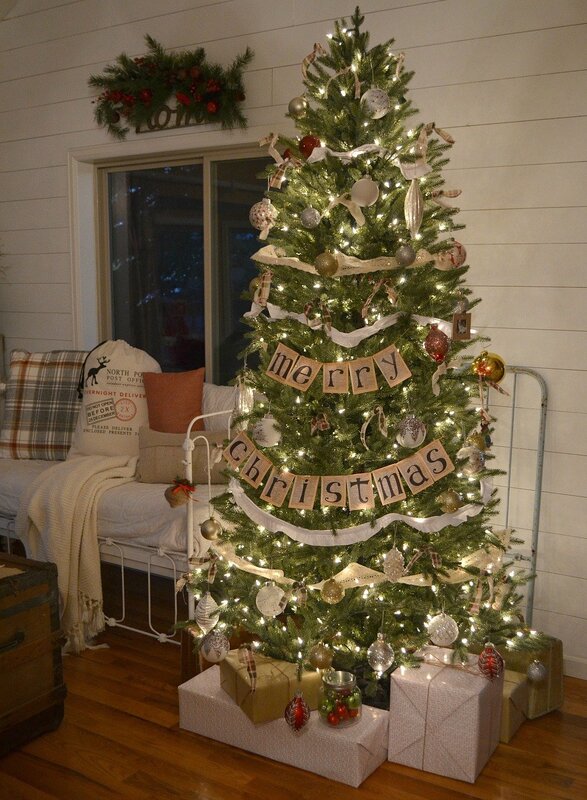 I also paired that with the white ruffle, I love how the two give a touch of farmhouse charm to the tree. This is my favorite ornament on the entire tree. This is the first photo we took of my son holding his newborn baby sister. If you look closely you can see that he’s kissing her on the forehead. Such a special moment, my heart can hardly handle it. 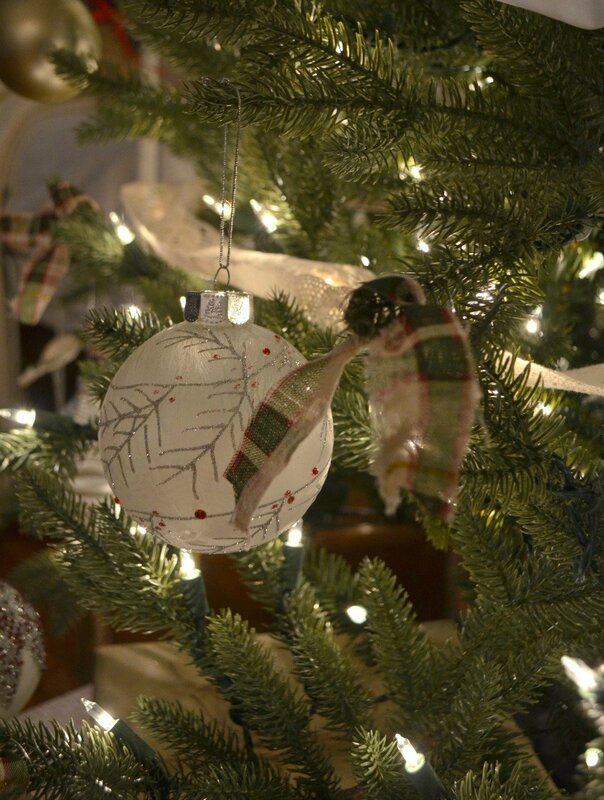 One other thing I did to add a bit of character to the tree was tie little strips of fabric on to a few of the branches instead of more ornaments. I’ve never tried this before but I love the way it looks. Ok, I gotta jump over to my coffee table centerpiece and show you that purdiness real quick! 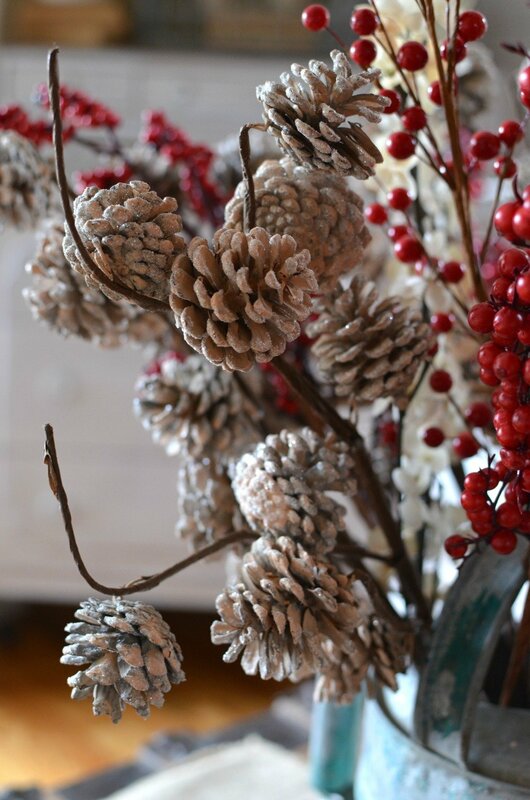 I don’t know about you guys, but I’ve never seen pinecone stems like this. 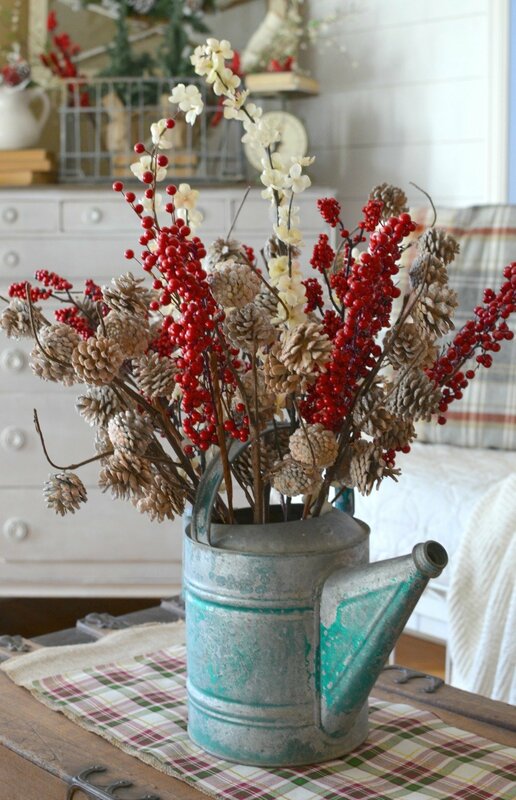 They’re Balsam Hill’s Winter Pinecone Picks and I think these are actually meant to go on your tree, but I just looooove them in my old watering can. So darn gorgeous! Of course I have to share a few shots of the tree all lit up and glowing. The thing I love about this tree is that it came pre-lit, so I literally didn’t have to add one strand of lights to it. Definitely a big time saver for me. So there she is! 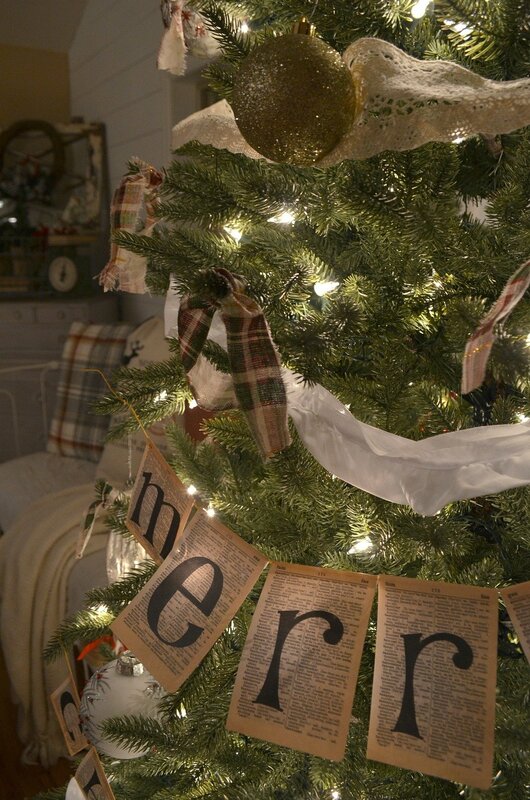 I had so much fun styling our Christmas tree and adding bits of vintage charm to it with the old book page garland and strips of old fabric. 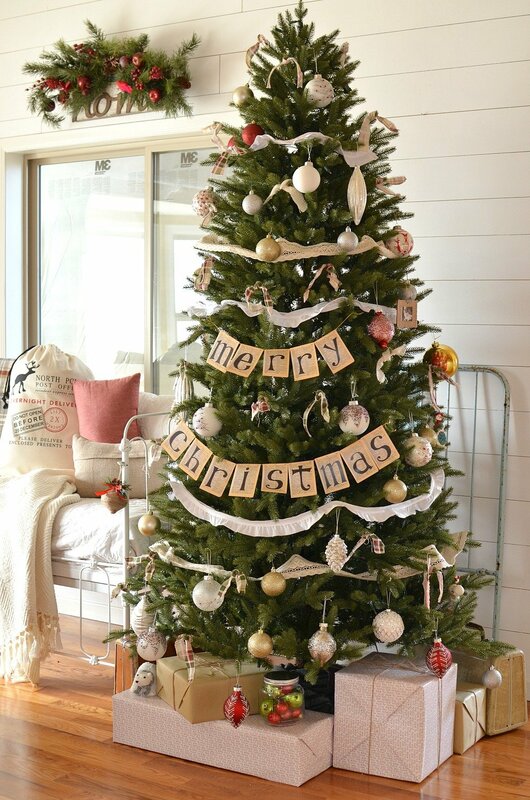 I also love the way the different fabrics add texture and interest to the tree, without being too distracting. And I know I already raved about it, but this Balsam Hill tree is ammmmazing. 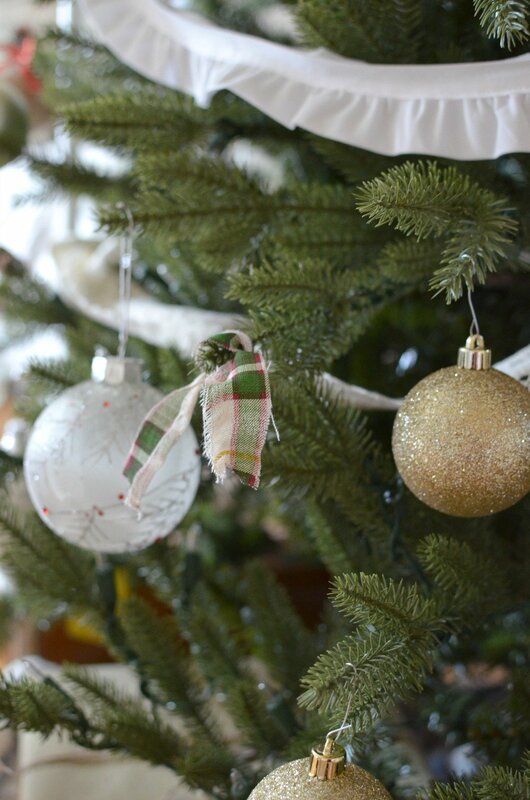 We’ve always bought real trees in the past, simply because I’d never seen an artificial tree look like the real thing–and from my experiences they were always a hassle to put up. But I can truthfully say that I’ve been really impressed with not only the quality of this tree, but also how easy it was to assemble. The only thing it lacks is that yummy Christmas tree smell, but thanks to a tip from my friend I’ve got one of those smelly-good things plugged in over in the corner to give this room that pine-y smell of Christmas! Good trick, huh!? Love it! I really love the book garland! Where did you get that or did you make it? I may have to add that to my tree this year. Also love the lace idea!! Thanks for your inspiration! Hi Donalee! I actually bought that book page garland last year, but I might do a quick tutorial on one. It would be easy to do! Great! It would be fun to make! 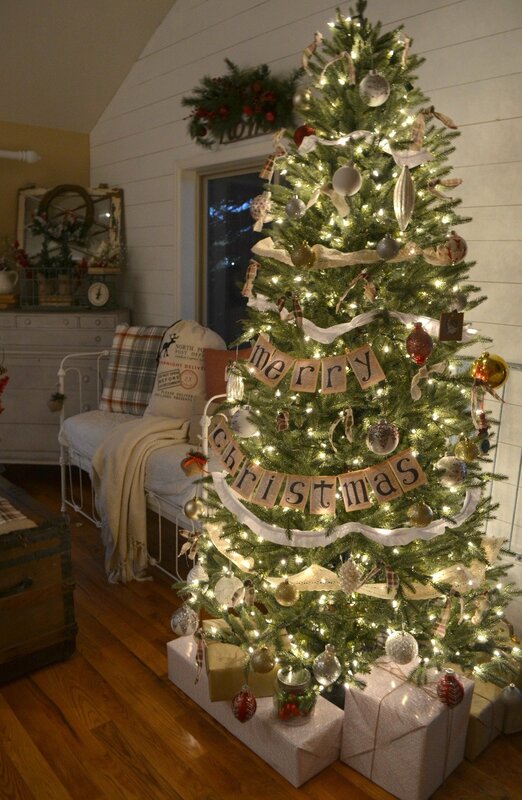 I have tree envy for sure………we have yet to go artificial so I am still stringing lights for hours and watering twice a day???? Aw thanks so much Nicole! So glad you liked the tree! this is so amazing! what a charming country christmas! ???? Thanks Kim! Very simple, but charming for sure! 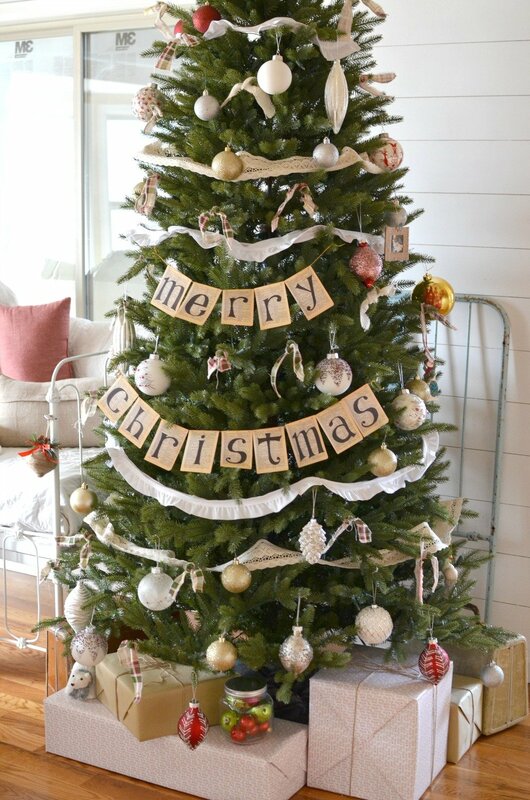 What a beautiful tree and I love the idea of strips of material and the garland. The photo of your son with his baby sister is adorable. Great memories. 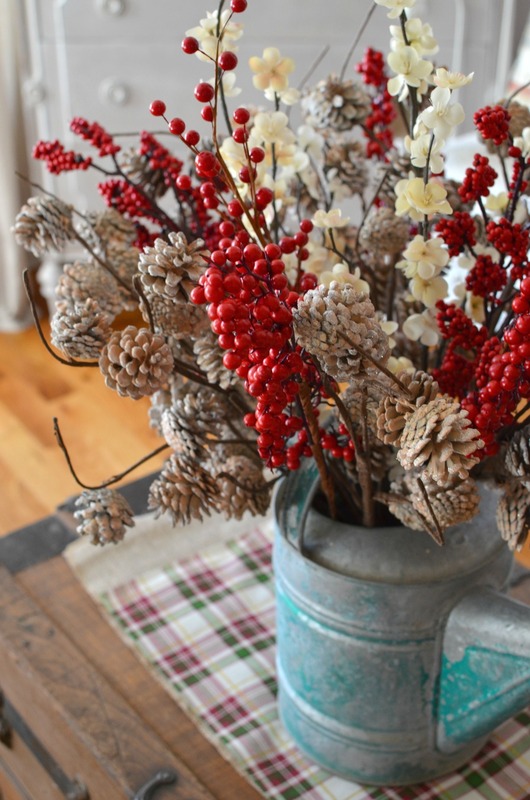 The centerpiece of pinecones and berries is also so pretty. Enjoy. ???????? 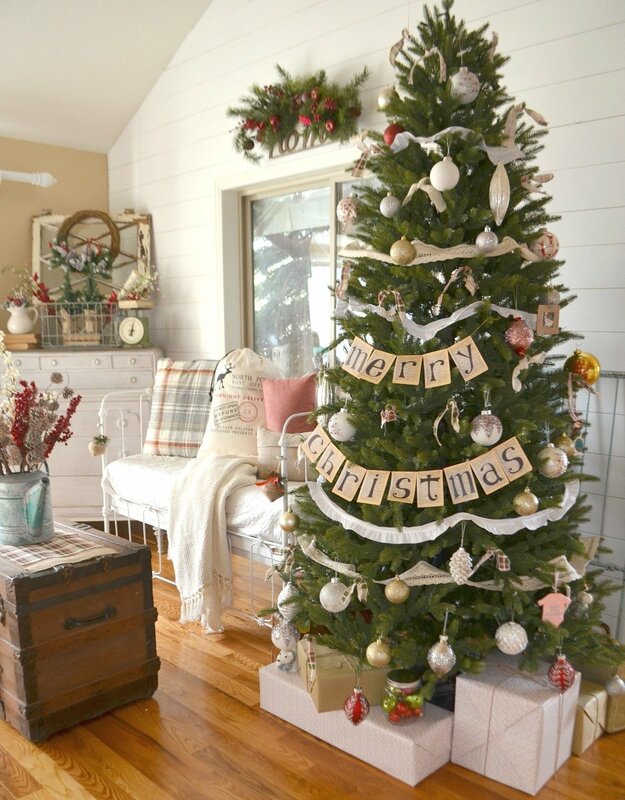 I love the country christmas and will refer back to it this week as I decorate!!!! My main question is Where did you get the iron day bed?? I’ve looked for one like this forever!! Thanks and Merry Christmas???? Hi Kathleen! That antique crib belonged to a family member actually. We converted it into a couch! They can definitely be hard to find, but they’re out there–keep searching! 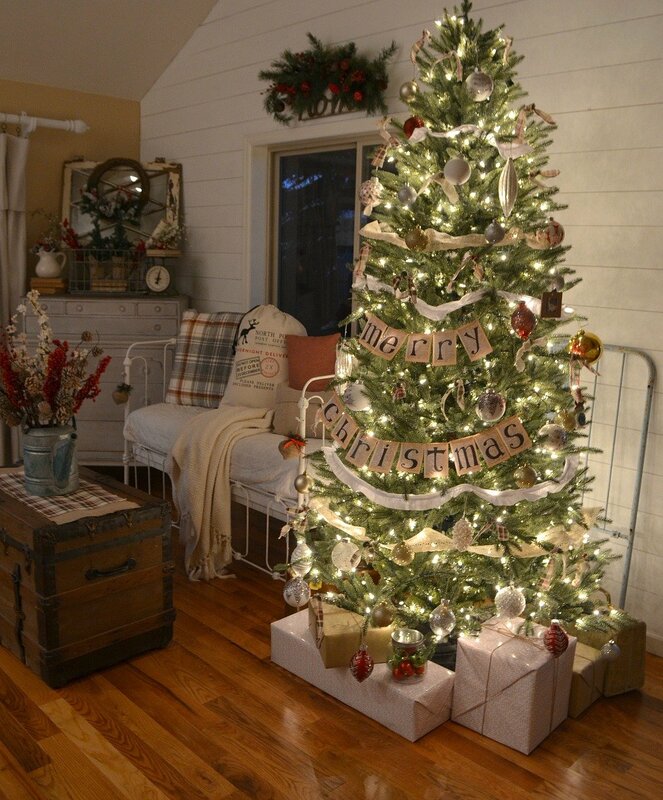 Love your Farmhouse Christmas tree…..so simple and yet so pretty! Love that you showed photographs in the evening, too. Blessings…. I love the garland!! Very pretty and sweet. ???? Sarah, absolutely beautiful. Everything !!!!! Thank you Doreen!! Hope you’re doing well. What kind of fabric do you use for the garland?? Did you make it yourself or buy it that way? ?